The upper back is the area from the base of the neck to the waist. There are several muscles that work together here to facilitate a number of movements. It is difficult to distinguish between a muscle tear or another injury of the upper back. The pain can also come from the spinal column. The physiotherapist can help to track down the cause of the symptoms. Tearing or spraining of muscles is a common cause of back pain. This can happen when the muscle fibres in a muscle are stretched excessively. The severity of the injury depends on the number of muscle fibres that tear. In the case of a slight sprain, only a few fibres are torn. In more severe cases a larger section of the muscle is torn. 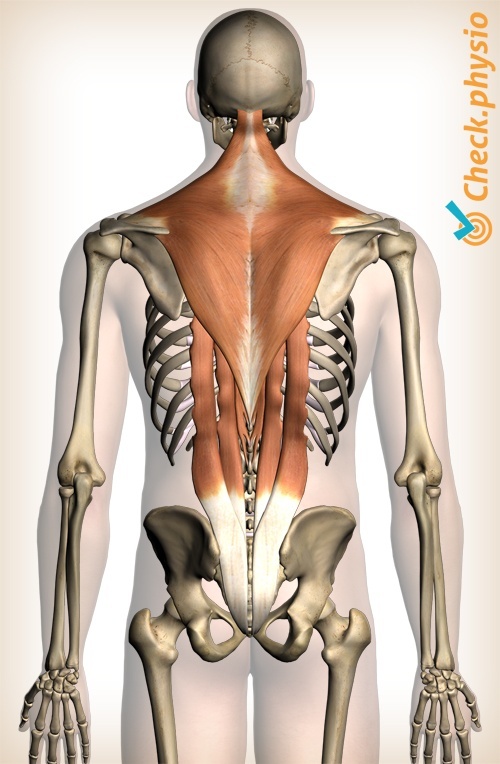 Muscles that can be affected include: the erector spinae, the trapezius, the rhomboideus, the latissimus dorsi, the levator scapulae and the muscles that are located between the ribs (intercostal muscles). The symptoms usually occur at a clearly defined time or through severe physical exertion. Sometimes the symptoms develop gradually as a result of prolonged overloading. Contracting the affected muscles can cause pain, for example in bending or stretching of the back, lifting objects or pulling the shoulder blades together. The pain often decreases in rest. Direct pressure on the affected area of the muscle is painful. Typical symptoms can include: muscle weakness, muscle spasms, swelling, inflammation and cramps.